The hug took place at a White House meeting to which Trump had invited law enforcement leadership to thank them for their role in the inauguration. Comey described really not wanting to go to that meeting, for the same reason he later did not want to go to the private dinner with Trump: the FBI director should be always at arm’s length from the President, in his view. There was an additional sensitivity here too, because many Democrats blamed Comey for Trump’s election, so he didn’t want any shows of closeness between the two that might reinforce a perception that he had put a thumb on the scale in Trump’s favor. But he also felt that he could not refuse a presidential invitation, particularly not one that went to a broad array of law enforcement leadership. So he went. But as he told me the story, he tried hard to blend into the background and avoid any one-on-one interaction. He was wearing a blue blazer and noticed that the drapes were blue. So he stood in the back, right in front of the drapes, hoping Trump wouldn’t notice him camouflaged against the wall. 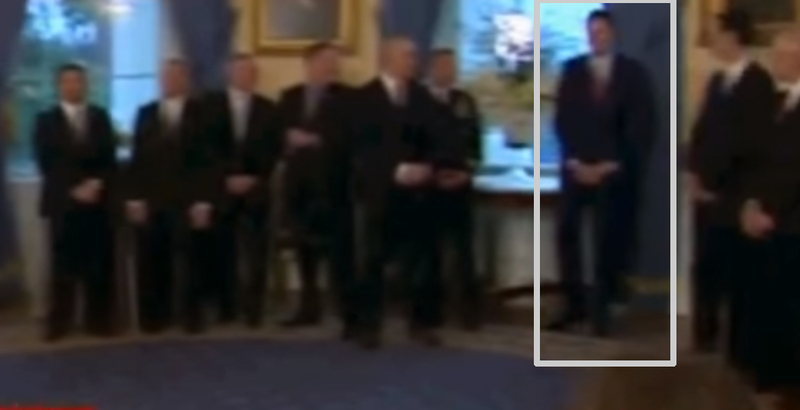 If you look at the video, Comey is standing about as far from Trump as it is physically possible to be in that room. If true, it's another piece of the Comey puzzle. He clearly changed the results of the election, and the question has been whether he issued his now-infamous letter about (GODDAMMIT) Hillary's e-mails to torpedo her campaign or to cover his own behind. The chumminess shown here was something that didn't really fit the second, more charitable explanation. But now getting to see the whole picture, it appears he was suckered into this by Trump. And given that playing people for suckers is all the Trump is about, this explanation makes a lot of sense. He still acted extremely irresponsibly through this whole thing, and I don't think anyone should call him a hero, no matter where things go from here, but it appears he was more of a pawn than a malicious actor.